During the early period of the war in Palestine Sheikh Hassan sent a contingent of Moslem brothers to the front and they were supplied with arms and munitions. It was not until the middle of the last summer that the terrorist operations began. These culminated in the autumn’s outbreaks of bombings and killings. NOTE: In the following articles, the spelling of Hassan al-Banna’s name is not consistent from one article to the next and the spelling of the word “Moslem” differs from what we usually find today. In all cases, it respects what was printed in The New York Times then. CAIRO — Egyptian police have arrested thirty members of the largest terrorist organization in Egypt and have solved the mystery of a series of bombings, political assassinations and attempted assassinations, authoritative quarters disclosed today. These quarters announced tonight that men arrested in a jeep loaded with explosives last Monday were members of the Moslem Brotherhood, militant Moslem nationalist movement. Others, arrested in the house of one of the passengers in the jeep, also belonged to the Brotherhood. Explosives, sufficient, according to the newspaper Al Zaman, “to blow up a whole quarter of Cairo”, have been confiscated. In house searches accompanying the arrests, police found documents, maps and drawings indicating the plans for further assassinations and for the bombing of department stores and foreign and Egyptian institutions in Cairo and Alexandria. It was stated that documents found in the jeep led to the discovery of “very huge amounts of explosives in other places”. The condition of the high explosives indicated that they were being used for “large-scale acts of destruction”. The jeep itself contained “large amounts of explosive materials, fuses, dozens of various kinds of mines, time-bomb detonators, a machine gun, a large number of revolvers and tommy guns, daggers, ammunition, a mask, leaflets and secret instructions and documents referring to previous explosions as well as others in preparation”. According to the authoritative account, a detective approached the jeep on Monday afternoon. It lacked a number plate and was parked in front of a house in the Waili sector of the Abbasia district. It contained closed cases and filled sacks. As soon as they saw the detective, the jeep’s passengers fled. The detective, with a fireman and a passerby, gave chase and caught several of them. The Prosecutor General’s office is continuing the investigation. The Brotherhood was headed by Hassan El Bana, its “Supreme Guide”, who recently had made a pilgrimage to Mecca. It is considered to be a powerful extremist organization, combining religion with nationalist appeals. Founded twenty years ago by El Bana, a former school teacher, it now claims 1,000,000 members in Egypt and many more in Arab and Moslem countries. Leaflets and other papers found show that the persons involved were motivated by the belief that the individuals and the organizations they attacked and planned to attack had connections with Zionists. The following list of outrages was attributed to the terrorist organization: the explosion outside the house of Mustapha El Nahas, president of the WAFD, early in the year; the attempted bombing of the Sudan Agency; bombing of department stores of Ades, Ben Zion, Gettegno, the Delta Land Company and the Société Orientale de Publicité and the most recent tommy-gun attempt on the life of Nahas Pasha. Saleh Ashmawi, editor in chief of the Moslem Brotherhood`s daily newspaper, declared late tonight that none of the men arrested were really members of the Brotherhood and that the charges levelled against the organization were a frame-up. CAIRO – Premier Mahmoud Fahmy Nokrashy Pasha as Military Governor of Egypt, ordered tonight the dissolution of the Moslem Brotherhood. The Brotherhood, which says it has 1,000,000 members in Egypt and a large following in other Arab states, especially Syria, is the most powerful mass organization in this country. It is headed by Hassan el Bana, a former elementary school teacher, who founded it twenty years ago. Abdel Rahman Ammar Bey, Under Secretary of State for Security in the Ministry of Interior, in a memorandum tonight, for the first time officially accused the Brotherhood of “aiming at seizing power and overthrowing established order in the country”. He charged the Brotherhood with being responsible for a six months’ series of bombings, assassinations and riots. The action was the Government’s boldest and most drastic move to end disorders and re-establish public security. In his capacity of Minister of Interior, Nokrashy Pasha proclaimed a “state of emergency throughout Egypt” just before midnight as the police moved to surround the Brotherhood headquarters and post guards at all of its branches, estimated to number about 300. House searches and possibly the arrest of many members of the organization were expected during the night. The secretary general of the Brotherhood was interned and some thirty members arrested last month soon after the last and biggest of a series of explosions in newspaper offices. The dissolution order closed and confiscated all of the Brotherhood’s premises which include those of one daily and one weekly newspaper, several farm and manufacturing cooperatives and a group of medical dispensaries. Several units of volunteer irregulars in Palestine belonged to the Brotherhood. Brotherhood members were forbidden to continue any form of activity, to hold elections, or establish other organizations that might constitute indirect revivals. A government official was designated to liquidate the Brotherhood’s financial and other assets and to distribute them to charitable societies. Violations of the order were made punishable by six months to two years in prison and fines ranging from £200 to £1,000. Ammar Bey’s memorandum said the Brotherhood had been founded as a religious and social organization without political purpose. When its leader began to feel their strength, however, they revealed their real ambitions, which “went beyond legitimate political purposes to other aims prohibited by the Constitution and the country’s laws”. He said they aimed at “changing the basic system of society by force and terrorism”. He mentioned students and Government officials as being among those subject to the group’s propaganda. The Brotherhood itself has always denied the use of terrorist methods, maintaining that its aim was to re-establish pure Islamic values as set forth in the Koran. It combines a religious appeal with a fanatical nationalism and a rudimentary system of social services. CAIRO – Discovery of a large store of arms and ammunition belonging to the Moslem Brotherhood in the Old City of Cairo was announced today by Premier Mahmoud Fahmy Nokrashy Pasha. A Government communiqué later added that the cache included dynamite, 350 hand grenades, three machine guns and other incriminating materials such as false automobile license plates. This was the latest police move to eliminate the Moslem Brotherhood, which was banned by military order just a week ago. CAIRO – The Egyptian Premier, Mahmoud Fahmy Nokrashy Pasha, was assassinated three minutes before 10 o’clock this morning by a veterinary student member of the Moslem Brotherhood, which the Premier banned on Dec. 8. The student, disguised as a police first lieutenant, saluted Nokrashy Pasha as he approached ab elevator on the ground floor of the Ministry of Interior on his way to his office, then whipped out a revolver from his trouser pocket and fired six bullets, five of which hit the Premier. Nokrashy Pasha died within a few minutes. The assassin, named Abdel Meguid Ahmed Hassan, placed the revolver to his own head as if to commit suicide but he was overpowered by guards. He is a 21-year-old student enrolled in the veterinary course at the medical College of Fuad el Awal University. Some time after the assassination of the Premier, King Farouk called upon Ibrahim Abdul Hadi Pasha to form a new Cabinet. Hadi Pasha accepted the task and several hours later he announced his new Cabinet roster of sixteen members. An aide de camp, who was standing at Nokrashy Pasha’s left, and others carried the Premier into an adjoining office, where he died before a physician arrived. Ibrahim Dessouki Abaza Pasha, Minister of Communications in the Nokrashy Pasha Cabinet, disclosed later that the assassin had told the police that he had killed the Premier “because he caused Egypt to loose the Sudan, surrendered Palestine to the Jews and dissolved the Moslem Brotherhood which had been the only organization fighting for Islam in the last twenty years”. Official quarters disclosed for the first time that there had been another attempt on the Premier’s life on Nov. 26. A young official of the Ministry of Commerce named Tear Elbar was said to have brandished a revolver as Nokrashy Pasha was entering the Saadist party club but he was disarmed before he could shoot. King Farouk at noon called on Nokrashy Pasha’s widow and his young son and daughter and expressed condolences and prayed over the body of the Premier. CAIRO – Two persons were killed and twenty-two injured today when a bomb exploded in the street in front of the Palace of Justice. It had been intended to blow up the office of the Prosecutor General handling the cases of the assassination of Premier Mahmoud Fahmy Nokrashy Pasha and other terrorist acts of members of the extremist Moslem Brotherhood. The quick-wittedness of an office boy in the Prosecutor General’s office saved the Court of Appeals quarters and a neighboring office from destruction, according to Police Commander Col. Mohammed Malfouz. Shafik Ibrahim Annas, who is about 24 and is employed in the Ministry of Agriculture, appeared in the outer office of the Prosecutor General at 8:10 this morning, carrying a small satchel. The office adjoins the Bureau of Investigation, which contains all the evidence concerning recent terrorist activities of members of the Moslem Brotherhood. Annas asked for the secretary of the Bureau of Investigation, Sayyed Effendi. When he learned that the secretary was not there, he left the satchel with an office boy, saying it contained papers. The office boy was suspicious of the weight of the satchel, and when Annas left, after refusing to open the satchel, he rushed out and put the police in the corridor on his trail. The police made the arrest quickly outside the neighboring Arabic Museum. Meantime the office boy placed the satchel outside the door. The police called a bomb expert, who advised that the satchel be taken into the open street. There it exploded a few minutes later, killing a cigarettes vendor and, according to reports, a police officer. Six other police officers are believed to have been injured. Windows of the Court of Appeals quarters were blown in, and some damage was done to offices facing the street. More than a hundred windows of the Arabic Museum were shattered. The police reports indicate that Annas had been previously arrested when a jeep carrying explosives was seized some time ago. The police identified him as a member of the terrorist group within the Moslem Brotherhood. The chief of the Brotherhood, which is a religious organization that turned to politics, issued on Tuesday a public statement against terrorism. VIENNA – A report that the terrorist Moslem Brotherhood in Egypt has formed a suicide squad of 200 men, each sworn to give his life to the cause in some venture such as the assassination of Premier Mahmoud Fahmy Nokrashy Pasha, was received by foreign diplomatic quarters just before this correspondent left Egypt recently. Nokrashy Pasha’s wife, it was also reported, had received a Brotherhood threat that if her husband’s assassin was executed her two children would be kidnapped. According to another report, seventeen Egyptian Army officers and forty civilians associated in plans for a military coup were arrested, along with a former chief of staff of the Egyptian Army. Only the latter arrest was officially admitted. It was not possible to confirm these stories. Army sources flatly denied the arrests. Censorship prevented the reports from being sent abroad. But informed foreign quarters believed they were true. In any case, they were symptomatic of the period of strain through which Egypt is passing as a consequence of defeat in Palestine. Censorship has obscured the facts, particularly internally, and aggravated their ultimate effects. Although the Moslem Brotherhood is officially banned and dissolved, foreign quarters and – in private – Egyptian officials fully expect it to stage more acts of terrorism. Many believe that it has been strengthened by having been forced underground. Another factor of possible disorder is the return of the Egyptian Army from Palestine, now underway. Inevitably disillusioned and embittered, the Army blames “the politicians” for Egypt’s misfortunes. The danger that certain military elements might try direct action in politics is heightened by the fact that there are estimated to be about 6,000 members of the Moslem Brotherhood in Palestine, in the army and among volunteer groups. Just what the Brotherhood and certain military elements want at this moment is obscure. The Brotherhood was begun as a religious movement, and its political attitudes and action have always been negative. Some army officers may want a military dictatorship. It is certain that both groups are deeply impregnated with hatred of Zionists, and hope to fight again at some future time. But it must be manifest to all that to do so in the present is materially impossible. CAIRO — Sheikh Hassan el Banna, 39-year-old head of the outlawed Moslem Brotherhood, extremist Egyptian nationalist movement that was banned after authorities had declared it responsible for a series of bombing outrages and killings last year, was shot five times today by a group of young men in a car and died tonight in a hospital. He was leaving the Young Men’s Association and entering a taxi when a fusillade struck his car. A companion was wounded. A member of the Brotherhood, Abdul Meguid Ahmed Hassan, killed Premier Mahmoud Fahmy Nokrashy Pasha last month in revenge for suppression of the organization. Several hundreds arrests were made after this act of terror and two internment camps were opened in connection with a government campaign to halt the Moslem Brotherhood’s terrorism. It was disclosed recently that an inner circle of the banned Brotherhood had recognized Sheikh Hassan as Caliph, which would have amounted to proclaiming him as political chief of the Islamic world. This group of eighty conspirators, it was stated, carried out acts of terror by lot. Sheikh Hassan, who was short and wore a black beard, was a noted orator. He organized the Moslem Brotherhood about twenty years ago when he was a school teacher in Ismailia, on the Suez Canal. At first it was a religious and reform organization and had no trouble with the authorities. During recent years, however, it had taken on the character of a political movement with mystic and fascist overtones. Sheikh Hassan’s followers were fanatically devoted to him, and many of them proclaimed that he alone would be able to save the Arab and Islamic worlds. The campaign of terror appears to have had the purpose of systematically intimidating the authorities, courts and police in preparation for a seizure of power. Sheikh Hassanhad not been arrested but recently he had been interrogated by the public prosecutor in connection with the preparation of the case against the murderer of Premier Nokrashy Pasha. 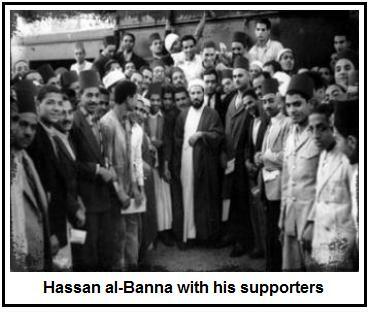 Whether addressing a crowd before the organization was banned or talking to authorities, Sheikh el Banna cited the Koran as support for all his arguments. Such religious and ethical reformers have been fairly common in the recent history of the Islamic countries. During the early period of the war in Palestine Sheikh Hassan sent a contingent of Moslem brothers to the front and they were supplied with arms and munitions. It was not until the middle of the last summer that the terrorist operations began. These culminated in the autumn’s outbreaks of bombings and killings. There have been charges but no verification that Communists are providing the funds for the movement to increase the disorder in the Middle East. Police reported that Sheikh Hassan’s companion was his brother-in-law, Abdul Kerin Mohammed. He was wounded in the arm and leg. The youths sped away in their car. Cairo police are combing the city in the search for them, but they have not yet been found.